Objectives: The objective of this regional study across Wales was to perform a preliminary examination of Welsh emergency vehicles to determine levels of bacterial contamination. Methods: Specific sites within emergency vehicles were swabbed, before and after vehicle cleaning, over a 12 month period, on a monthly basis. All swabs were sent to pathology laboratories for culturing and analysis. Results: Results showed that most sites within emergency vehicles across Wales were contaminated with a range of bacterial species before vehicle cleaning. After vehicle cleaning, many sites in vehicles were still contaminated, and some sites that were previously uncontaminated, became freshly contaminated as a result of cleaning methods used. Conclusions: The authors conclude that the Welsh emergency vehicles examined exhibited an unacceptable level of bacterial contamination. This finding should be carefully considered and all attempts must be made to tackle the problem of vehicle cleanliness and infection control. A pilot investigation was carried out to examine the extent of bacterial contamination in emergency vehicles, and to assess how effective current cleaning protocols were in reducing bacterial contamination. The project was carried out over 12 months (January to December 2000) and involved vehicles from three regional areas of Wales (A, B, and C). Region B was further subdivided into geographical areas 1, 2, and 3. The investigation was designed with the help of students on the BSc Pre-hospital Care degree scheme (1998 cohort), and with the full cooperation of Central and Regional NHS Trust Ambulance Officers. Sampling of vehicles was carried out monthly. This involved an on-call paramedic who was asked to swab allocated areas of the vehicle, once before cleaning, and once immediately after general vehicle cleaning and drying. Rails of grid/track, or floor if no track. Each sterile swab was quickly dipped in sterile saline immediately before swabbing. The moist swab was passed across the surface to be tested and rotated to collect as much material as possible. The specimens were preserved in charcoal during transportation. After initial swabs were taken, the vehicle was cleaned, and the process repeated. Each month, 14 swabs (seven before cleaning and seven after) were sent to the Public Health Laboratory, Swansea for culture. Vehicle cleaning varied from crew to crew depending on various limitations. Of these, time was the most important factor, followed by the availability of detergents and disinfectants. The range of cleaning equipment used included mops, blue rolls, towels, pillowcases, and various rags and cloths. Solutions and solvents available for cleaning also varied greatly, and included general purpose detergents, phenolic pine disinfectants, Tiket, 10% bleach solution, Domestos, 2% stericol, 0.02% chlorhexidine gluconate, hypochlorite solution, and alcohol and chlorhexidine wipes. Each swab was plated directly on to blood agar culture medium and incubated at 37°C for 48 hours. After incubation, the total number of colonies on each plate were counted and reported. Sensitivity to antibiotics was not tested, and no attempt was made to identify viral contamination. In total, over the period of the 12 month study, 82 sites within vehicles were sampled before cleaning and 82 sites after cleaning. (The total number should have been 84, but in two cases, swabs were either not taken from suction bottles, or were not sent to the microbiology laboratories for analysis). Results obtained after the culturing of swabs indicated that most areas within emergency vehicles were contaminated with bacteria. Figure 1 shows the total number of sites in emergency vehicles that were positive for bacterial contamination before and after cleaning. Before cleaning, almost 61% of all sites swabbed had bacteria present. After cleaning, this figure was reduced to about 35%. Although, after cleaning, most swab sites demonstrated a reduction in bacterial count, there were still many contaminated sites and there was evidence of fresh contamination in or on some sites. For example, 33.4% of steering wheels were contaminated before cleaning (table 1), but 41.7% were contaminated afterwards (table 2). Total percentage of sites in emergency vehicles positive for bacterial contamination. Figure 2 gives a regional breakdown of sites within vehicles that were positive for bacterial contamination before and after cleaning. From this figure, it can be seen that vehicles sampled in region A had the greatest number of sites positive for bacteria (78.6%) before cleaning. After cleaning, however, this region (A) showed the most dramatic reduction in the number of contaminated sites (32.1%) compared with other regions. 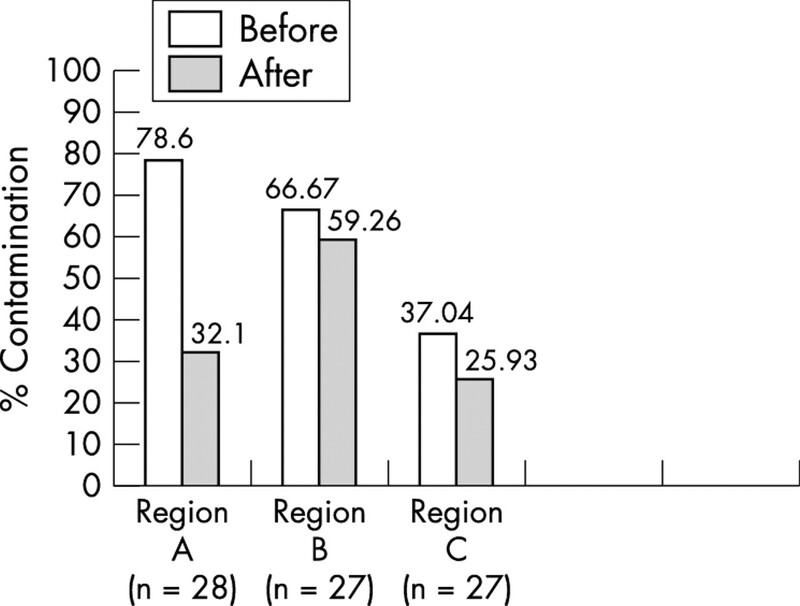 Interestingly, cleaning of vehicles in both other regions (B and C), had little overall impact on the level of contamination, although vehicles in region C had the lowest numbers of contaminated sites before and after vehicle cleaning (fig 2). Regional breakdown of percentage of sites contaminated in emergency vehicles from all regions, before and after cleaning. Figure 3 is a further area breakdown showing percentage numbers of sites contaminated within vehicles of region B. Notably, before cleaning, about 67% of sites sampled in area 1 of region B were positive for bacteria. After cleaning, however, no bacteria were found on any of the sampled sites of the vehicle in this region. Alarmingly, however, data obtained from area 3 of this region showed that the number of sites contaminated in the vehicle had increased from 57.1% before cleaning to 86% after cleaning (fig 3). Regional breakdown of percentage of sites contaminated in emergency vehicles in geographical areas within region B, before and after cleaning. Table 3 lists different species of bacteria found contaminating sites before vehicle cleaning. It can be seen from the table that the species of bacteria found most frequently were coliforms (31.5%), Staphylococcus epidermidis (30.1%) and Bacillus species (21.9%). Table 4 is a list of different species of bacteria found contaminating sites after vehicle cleaning. The most prevalent species of bacteria found were Staphylococcus epidermidis (29.4%) and coliforms (26.5%). Finally, tables 1 and 2 show the percentage number of swabs from each site that were positive for bacterial contamination, before cleaning and after cleaning respectively. Also shown is a list of the main species of bacteria identified after culture of swabs. Results presented in table 1 show that before vehicles were cleaned, a high number of floor swabs (91.7%) were positive for bacterial contamination. This is to be expected and poses minimal risk of infection. However, 58.4% of swabs from Entonox masks were also contaminated and this has a greater potential to be a source of infection. In addition, a high percentage of swabs cultured from suction bottles (70%) revealed the growth of various micro-organisms. Most importantly, coliforms were commonly found in nearly all sites sampled. After vehicle cleaning (table 2), the percentage of sites contaminated with bacteria decreased, with the notable exception of steering wheels. In the case of steering wheels, the percentage of steering wheels contaminated increased from 33.4% (before cleaning, table 1) to 41.7% after they had been cleaned. Moreover, species of bacteria that had not been present before cleaning, namely coliforms and Bacillus sp, could now be detected on the steering wheel. The percentage of Entonox masks and suction bottles that were contaminated after cleaning were 41.7% and 20% respectively. The results presented in this pilot study show clearly that there is bacterial contamination of emergency vehicles within Wales, although this is generally reduced after vehicle cleaning. There seems to be some regional variation in the level of contamination of vehicles, and the ability to effectively eradicate contamination after cleaning of vehicles, perhaps demonstrating a lack of consistency in frequency and method of cleaning across the Trust. Most notably, vehicles in region A and area 1 of region B showed the best reduction in contamination after vehicle cleaning. Worryingly, however, vehicle cleaning in area 3 of region C resulted in an increase in the number of vehicle sites contaminated with bacteria. Most of the species of bacteria found contaminating various sites within vehicles were harmless, non-pathogenic species, and are representatives of natural environmental and skin flora. Some, however, for example S aureus and S viridans, are potential pathogens. Contact with the contaminated environment, fomites, equipment, etc, will contaminate hands. The role of contaminated hands in the transmission of such infections has been well reported.1 Similarly, contaminated cleaning equipment may be to blame where bacterial counts after cleaning exceeded those before. The widespread distribution of coliforms was also of interest. Most coliform bacteria are faecal organisms, and have been implicated in infection. Their abundant presence in and on many sites within emergency vehicles is an indicator of high levels of cross contamination. Continuous, fresh sources of contamination are possible with every emergency case, and anyway, paramedic crews regularly trampling on and off vehicles would themselves enable a steady supply of bacteria to be carried on board. Emergency vehicles, because of the very nature of their role in offering prehospital care and transport to patients, cannot be expected to be sterile, microbe free units. Nor is this considered to be necessary. Bacteria were identified in the Entonox mask both before and after cleaning. Although sterility is not required in these masks, as these masks are designed to provide rapid and direct pain relief via the lungs, significant contamination with certain organisms may introduce further complications in an already traumatised patient. It would seem that the general process of vehicle cleaning needs further consideration. In most cases, vehicle cleaning resulted in successful elimination of bacteria from previously contaminated sites. However, on several occasions this was not the case and cleaning of sites either had no effect on reducing bacterial contamination, or resulted in the introduction of new species of bacteria. At the time of the investigation, there seemed to be no prescribed cleaning schedule in any of the regions. Cleaning equipment and materials varied, and the fact that cleaning occasionally increased the bacterial load and introduced new species of bacteria on to the equipment suggests that adequate decontamination of the cleaning equipment itself does not take place. Many of the solutions used for cleaning, such as chlorhexidine gluconate and stericol are unsuitable for routine environmental cleaning. Others are more properly used for specialist decontamination, for example chlorine releasing agents such as Domestos are necessary for decontaminating spillages of blood, but may be damaging to certain equipment and should not be used routinely. It is neither necessary nor desirable to use disinfectants for routine cleaning. Detergent and hot water is adequate. Moreover, the amount of time available for cleaning the vehicle before the next emergency call out, was a critical factor in the level of attention a vehicle could receive. There was no dedicated cleaning equipment for vehicles and no standardised detergent or cleaning protocol. Crews used all sorts of clothes and rags to clean and dry vehicle sites. Cleaning of sites such as the Entonox mask and suction bottles was reportedly scarcely undertaken. Such observations may partly explain the high levels of bacterial contamination found after cleaning of vehicles. This small study was confined to a limited number of emergency vehicles in Wales, and this must be borne in mind when considering the results and conclusions drawn. There is, however, no evidence to suggest that the level of bacterial contamination seen in vehicles in Wales is any different in vehicles of other ambulance services within the UK, where perhaps similar projects need to be undertaken. In summary, from the results of this study, we can conclude that there is unlikely to be any immediate danger to patients and crew from the current level of bacterial contamination. Nevertheless, the study illustrated that current levels of cleaning are inadequate and could result in environmental contamination with potential pathogens. Therefore, vehicle cleaning processes and regulations need to be examined to reduce bacterial contamination with potentially harmful species of bacteria, for example S aureus, and to prevent the introduction of bacteria from cleaning equipment. Adequate supplies of detergent for general cleaning and chlorine releasing disinfectants for decontamination of blood spillages must be provided. Sufficient mops, cloths, and buckets should be available to allow the cleaning equipment itself to be cleaned and dried between use. All cleaning equipment and materials should be dedicated solely to the cleaning of the ambulances, and not used to clean other areas such as toilets, which could result in cross contamination. Provision of a cleaning schedule would allow a systematic approach to cleaning and decontamination, and should include information on frequency and methods of cleaning. A policy should also be available to all crews outlining the most suitable method of decontamination of all medical devices, for example, Entonox masks and suction equipment. Since this project was undertaken, changes have been made within the Welsh Ambulance Services NHS Trust to tackle the issue of infection control. An Infection Control Committee and Infection Control Teams have been set up which receive advice from an infection control nurse. These groups will oversee all infection control activities within the Trust, will devise and implement infection control policies, and audit infection control practices, including standards of cleanliness. The impact of such moves are already evident, for example, purchase of new cleaning equipment is ongoing, increased use of disposable mouthpieces to replace Entonox masks, and the provision of disposable suction canisters to replace reusable suction bottles, is in progress. These actions are seen as a very positive approach in attempting to deal with such a potentially serious and very difficult problem. We gratefully acknowledge the support and cooperation of the Wales Ambulance Services NHS Trust, in particular Mr J Bottell, Mr D Ellis, Mr D Lydon, Mr D Jones-Morris, Mrs I Whitnell, Mr S Salter, and Mr R Morgan. This study relied upon the absolute generosity of Dr D Joynson, Consultant Microbiologist and Director of Pathology, Singleton Hospital, Swansea, and the staff of the Public Health Laboratory, Singleton Hospital. The continuous encouragement of Dr Barbara Green, Director of School of Health Science, University of Wales, Swansea is also gratefully acknowledged. Many thanks also to Mike Collins (National Training Manager, Wales Ambulance Services NHS Trust) and Nikki Williams, for advice and critical reading of the report. Finally, the project would not have been possible had it not been for the willing and competent participation of paramedics on the PHC degree 1998 course; Mike Jenkins, Jamie Todd, Mark Richards, Andrews Williams, Jo-Anne Dyson, Steven Holland, Jean Susdorf, Andrew Jenkins, Yvette La Flamme-Williams, Grayham McLean, and Tim Jones, to whom grateful thanks are extended. Gould D. Nurses’ hands as vectors of hospital-acquired infection: a review. J Adv Nurs1991;16:1216–25. Advisory Committee on Dangerous Pathogens. Protection against blood-borne viruses in the workplace: HIV and hepatitis. London: HMSO, 1995.